Tuesday afternoon, J.K. Rowling tweeted some huge news about some of her beloved characters from the Harry Potter universe. “Have just heard that James S Potter has been Sorted (to nobody’s surprise) into Gryffindor. 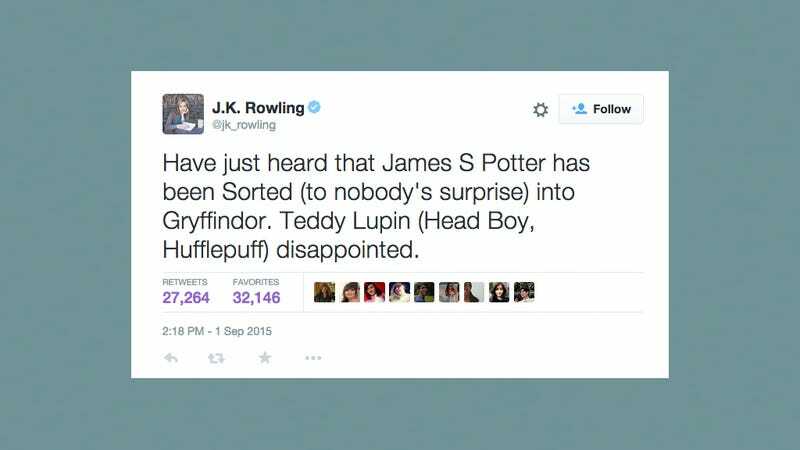 Teddy Lupin (Head Boy, Hufflepuff) disappointed,” she wrote to her 5.32M followers. It’s sort of nice to know Rowling is still thinking about her creations (how could she not, really), but makes me wonder about the future of any beloved literary franchise. In the place of upcoming novels, will fans of the Harry Potter series receive occasional updates in 140 characters or less?